TAMPA, Fla. (AP) -The Washington Capitals kept their playoff hopes alive with a late comeback. 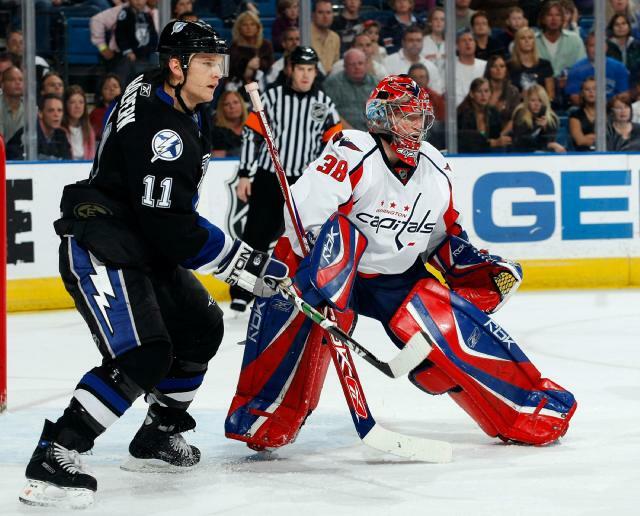 Tomas Fleischmann scored with 2:33 left in overtime to lift the Capitals past the Tampa Bay Lightning 4-3 on Thursday night. "The sense of urgency is an amazing thing," Washington coach Bruce Boudreau said. "The season is on the line. We don't even know at this stage if we can afford one loss the way everybody else is winning." "We still believe we can make the playoffs," Fleischmann said. Fleischmann had no points in his previous 10 games, and also snapped a 14-game goal-scoring drought. Washington drew even at 3 when Sergei Fedorov won a faceoff, setting up Alexander Semin's goal from the top of the right circle with 4:48 remaining in the third. Laich and Matt Bradley also scored for the Capitals, who remained two points out of eighth place in the Eastern Conference. Washington trails Southeast Division-leading Carolina, which has one game in hand, by two points. "We're in a dogfight here," Laich said. "We're desperate, we're hungry. It's a great time to play right now." Capitals center Alexander Ovechkin, who has a league-leading 61 goals and 107 points, didn't get a point. He had several scoring chances in the first, including a shot from the slot that went just wide of the net midway through the period. Washington has won seven of eight. Cristobal Huet stopped 23 shots. Jeff Halpern, Alexandre Picard and Michel Ouellet had the Tampa Bay goals. The Lightning, last in the Eastern Conference, have lost 14 of 19. Lightning defenseman Dan Boyle had a scary moment on Fleischmann's goal. Lightning defensman Shane O'Brien pushed Washington's Mike Green on the play, and Green's skate grazed Boyle, who was on his knees, on the lower neck. Boyle was not seriously hurt, but the skate caused an approximately 6-inch cut. "Obviously it wasn't as worse as it could have been," Boyle said. "But at the same time, what else can happen? It's just been a miserable year." Boyle missed 45 games this season after undergoing left wrist surgery. The wrist was hurt when Boyle's skate slipped off a hook over his locker on Sept. 22. Tampa Bay is 7-35-4 when tied or behind after two periods. The Lightning have been outscored 109-72 during the third. "I'm not going to talk about the third period," said Lightning coach John Tortorella, who walked out his postgame news conference after two questions. The Lightning went up 3-2 when Ouellet scored 6:51 into the third period. Bradley gave Washington a 2-1 lead from the left circle early in the second period. Matt Cooke nearly made it a two-goal game, but his shot hit the post. Notes: Laich has a career-best 20 goals. ... Lightning C Vincent Lecavalier assisted on Picard's goal for his 600th career point. He has played in 706 games. ... Capitals D John Erskine returned after missing the previous six games with an upper-body injury. ... Tampa Bay G Mike Smith (left knee sprain) sat out for the second straight game. He is day to day. ... Lightning C Nick Tarnasky left with blurred vision after being accidentally elbowed by a linesman.